It looks like JCPenney is shopping around for Pinterest-loving moms in an effort to bring them back to its brick-and-mortar stores. The retailer has partnered with Pinterest to place special digital Pinterest boards displaying its variety of merchandise in 10 malls across the US. AdAge.com shared the big picture on how JCPenney is using the photo-sharing social media site to inspire the interest of moms. The goal of this initiative is to show moms the value of JCPenney and how the brand is well worth their attention, time, and budget. By using special Pinterest boards to showcase its range of mom-centric products, the retailer hopes to prove its value as an easy, enjoyable, and economical shopping solution and experience. To achieve this goal, the retailer will use special 10′ x 9′ x 2′ digital boards to spotlight beauty, clothing, and hair inspiration. In addition to promoting JCPenney’s apparel, the boards will also feature beauty products from the Sephora beauty shops located in many of its stores. The initiative is a continuation of the retailer’s recent “Get Your Penney’s Worth” ad campaign created by McGarryBowen. Consumers can view the retailer’s Pinterest boards in the malls’ general shopping areas. 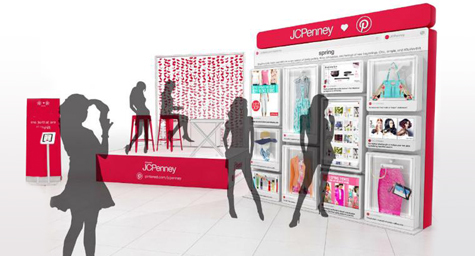 Then, shoppers can find the featured merchandise inside of JCPenney. To support the initiative, JCPenney has tapped more than 20 bloggers to write about fashion and beauty trends, ideas, and styles. Then the brand planned special events on April 23, 24, 30, and May 1, with store associates either modeling the merchandise or directing shoppers to the products. These events are designed to engage shoppers and give them a more meaningful and memorable shopping experience. JCPenney is well aware that Pinterest is a popular social media destination for moms, so it hopes that this alliance will position the brand as the local shopping destination for moms.